Highly legible, organized and functional. No longer can work on Apple Watch since Watch os 5. Please fix this!!! Says “The developer of this app needs to update it to work with watchOS 5” Bummer. Update - Where’s the Watch app???? What happened to the Apple Watch app??? Now I’m back to using Stocks on iOS 12 and watchOS 5. BTW - I agree with other reviewers that the news can instead be opinion. Please stick to the financial news. This is the one financial news app I use. Makes it easy to see the stocks I'm interested in plus it has good summary articles on financial stories. Great app, but wish font was bigger! I’m on the iPhone XS. The headlines and words under the headlines is appropriate size. Once I get to the actual article the font is tiny! I searched the settings but did not see any way to enlarge the font. Please add this! Bout an Apple Watch, enjoyed the CNBC app for about a week & now it doesn’t work. Any update for Apple W app? The news flashes from this app became unbearable. It’s amazing how every time the market went down, it was Trump’s fault. And every time market went up it was for every reason besides Trump. And the constant news flashes every time they think they have Trump in a ‘gotcha’ moment—it’s all too much. App deleted. There are other options. Good stats, many dumb articles by authors w/no investment experience. I wish CNBC would update there app because now all the smartphones are bigger the stock price is small they should make them bigger! My Apple stock app stopped working so I looked for another stick app and found this one. It works great. I am impressed with the news stories available to me in a timely fashion. It’s nice not to have to wait and only hear the news stories someone else has deemed important after the fact. Good stuff on the app, CNBC! Worthy, factual and interesting news and stories. Keep it flowing boldly, it’s what you do. Love ya, Thomas S.
Crash log every time I get a notification? Why is it that I get a crash log on my device every time I receive a notification? Plus the watch app isn’t even capable on watchOS 5. Fail. CNBC app makes stock trading easy and a hobby. I love CNBC daily coverage of financial news, particularly Wall Street. Keep it up. To my first time getting into stocks. And businesses that I believe in. This app, has made it so easy to keep up and read on the things I’m interested in buying into. I enjoy getting news alerts but do not enjoy getting stock market updates 3+ times a day. Please add a feature to not allow stock market updates. Your points of view are too liberal leaning when you should focus more on the economic facts rather than politicizing the stories. I’m an independent and I need information to better manage my portfolio. I use your app to assist me in assessing the markets. Focus on that and stay out of politics. I like the futures portion of this app. Horrible home screen redesign Horrible leftist articles yelling about trump and social policies. I thought this was a financial news site?!?!?!? Easy to read, really enjoy the premarket data. Really interesting content. CNBC is my go-to daily companion for market values and financial breaking news. I know you shouldn’t complain about something given to you for free. But the CNBC app pisses me off, because it has useful content and functionality yet it rips me from all of this every 45 seconds. Crashes all the time and sends me back to the iPhone home screen. I have an iPhone X by the way. Crashes should NOT be happening on the newest tech! The earnings numbers are not current, dangerous to depend on. Also now auto plays video ads which is annoying. Was a great app. Not so much now. Used to be simple to use, now the app crashes almost every time and they force ad videos on you, like literally when the app is open the video will play. I am not sure what is going on but it’s unavoidable. This app is a great way to look at stocks. Live broadcast is buffering a lot. It used to be much better. This used to be a business app where I could check business related news and stock prices. Now, it’s another media site suffering from TDS (Trump Derangement Syndrome). Trump could come out and say, “I love dogs!” and CNBC would have a headline in the app screaming, “Trump hates cats!” I’m no Trump fan, but can’t you just stick to business headlines? Deleted! Done in concise informative format. Writing style flows well. Solid site that never crashes. Provides stock data and financial news. Great for free. I’ve been looking for a stock market app for 10 years that gives YTD, 1 year, 3 year Total Returns. This is it. I use this app 10 times a day. Love it. CNBC keeps update the latest news and stories on a daily basis, which help its reader to cope up with the economic update. More importantly it provides much more faster breaking news than others. More often than not, the headline categories are badly dated. Almost daily, they have been on the App for over 24 hours! Further, if you are interested in doing research on a public company, the accessible information is woefully limited. Bloomberg’s App is far superior. This is a great app to keep eye on your stocks ,price ,history and news etc . This app shows not internet if I switch apps or lock my phone and come back but still shows articles but no pics and looks like crap when this happens. Otherwise good app. Too liberal in reporting. Border fake news on many stories. I use CNBC for market status only, other financial apps for news, financial news. The font is too small to read. Headlines are a good size font however the meat of the article is annoyingly too small. An extension of NBC’s anti Trump propaganda bias machine. It makes all of their articles suspected misinformation. So much fake news that they turned off their comments sections over a year ago. They must be afraid of the truth. NBC should lose their broadcast licenses as they are not operating in the public interest. Squawk Box did a article on the airbags that Honda is replacing. I have a 2010 Lincoln MKZ. Ford Motor Company has provide to me a rental car that I have had for two months. I am being told it would probably be a few more months before they change out the old unit. The employee at Thrifty Car rental told me the there company is receiving one million dollars a month from Ford. I downloaded this app to find out what the market was doing, but like a lot of the other news channels, You only have one agenda, you’re all about one thing hating on who’s ever in power that’s not a Democrat. I am a registered Democrat but I will be changing that! I am so sick of the movie stars on TV and the newspapers being one sided, you’re putting down half the country because they don’t agree with you, who the hell do you think you are? I don’t agree with a lot of things that Republican or Democrats do. I use my own mind to make my decisions on what I think is right, one is not better than the other it’s a matter of opinion and I will not allow anybody else to tell me what to do or tell me I’m stupid! I don’t believe I have to wear a red hat or a blue hat to prove that I have a mind, some people seem to think they are the elite and everybody should only listen to them. For the first time in my life I’m sorry I registered Democrat. Take the labels off, let’s just vote for people that Don’t have a label (Republican or Democrat)! When you go into the booth to booth you have to book for individual people not parties, I know of many people to go in there and just pull the one switch for the Home thing, mindless people that don’t take the time to check out would be best for the country. Do away with Republicans and Democrats parties, let’s see what would happen if we had to use our minds and vote for the person that we think is best not the party. Rant over... just my opinion take it or leave it you have a mind why don’t you use it!!! The add continues to pop up when I use this application. I love the app, but would like to see more on demand replay off tv shows (e.g. Fast Money, Mad Money). More written down the middle, less to the left......little more JK and MCC like influence. ...Because it offers a wealth of useful financial information. CNBC provides up-to-date quotes on stocks, bonds, indices, commodities, currencies and foreign markets. Most quotes are real-time, in an easy-to-use format. Their reporting on news, however, leaves a lot to be desired. Virtually every news story has a left-leaning bias, and most stories read more like an op-ed column from the LA Times, rather than factually accurate reporting. Many of the stories aren’t “news” at all....just a non-stop barrage of criticism and opinions on anything that could be considered moderate or conservative. This isn’t news, it’s political activism. If you are just looking for an excellent source of quotes, this is a great place to be. However, if you are seeking a balanced and professional source for news, you won’t be very happy here. Their news reporting is just an echo chamber of progressive opinions. News Update, July 6th - As you can see from my initial review, I like this app for quotes, but dislike it for the biased news reporting. I still find CNBC’s quote system to be the best available, but the news reporting just keeps getting worse. For the past week or so they have been running a news story daily entitled “The Best Travel Credit Card”, which isn’t news at all. It’s a solicitation for credit cards, disguised to look like a legitimate news story. CNBC continues to use their news reporting to mislead their viewers. This app has serious credibility issues. Reader beware. The app is very in user friendly and confusing I think the developers forgot that you’re suppose to be able to watch tv on it too. Do not download this app. App needs to be simplified, more user friendly and more easily assessable to watch tv shows. Trying to watch the morning show while getting ready for work this app has crashed about 15 times so far in the last half hour. Dont know why! App will pester you in the middle of use for a rating. You tend to beat a dead horse on various issues. You do not cover stocks of lower values even if they moving higher or lower. The CNBC app should have more news for the stocks. The app should show more info on their charts like macd, etc. Thank you for having a sight with actual news that I can actually get real information unlike the Network news I can’t tell the difference between the 6 30 news or Inside edition at 7 because the news resembles tabloid shows anymore. Thank you and please don’t change bringing the actual news! Fire whoever spell-checks your articles. And slap yourselves for all the dumb content created. It’s always easy for me to find information is pertinent to my interests. I like watching cnbc market shows. But the app wont work reliably on my ipad 4 . Just wont let me log in to my tv provider so i can watch the shows. So good bye to this app. Not liking the constant pop up video that’s the same annoying video again and again and again! Do you guy provide information on stocks? Or are you in the business of selling stupid pop up videos? The CNBC app is a solid resource for users to get their financial information from. Whether it be reading the latest and most popular articles, watching videos and programs live or from the past or looking up and adding stocks prices to a personal watchlist, CNBC looks to meet the needs of it’s users. While the interface design is a bit bland the app is easy to navigate which is more important considering the vast information that is presented. Good app, use it for fast check on my investments. Please fix this banner at the top! I have to crash the app to get rid of it. Maybe the app should remove when refreshing. App is good but quit bashing Trump. Relations with other countries are fine.. sometimes you argue things out to fix the problem. We had a major problem and the president is trying to fix it. The economy is doing well under 45. It was hopeless under 44. If people want to read a liberal viewpoint about everything this is your app. If you want to read and have guidance pertaining to money matters keep looking, this is not the app. Ridiculous how political views have to be in everything in today’s world. Great site. All the business news I need. Site allows me to track individual issues as well as mutual funds and ETFs. It is becoming more and more a propaganda machine than a financial news website. Such shame. Awesome application is you want to know the most important events ASAP!! I use(d) CNBC almost every day. It was always a quick way to get a financial news snapshot and some stock quotes. Today that have started forcing full screen advertising on the app even if you do not tap on it. It is a deal breaker! I’ll be using Bloomberg and BBC now as my primary business and news apps. If CNBC continues this new approach to advertising, it makes the app unusable for me and I will delete it. I try to watch life CNBC every morning on the way to work and around the house. The app works excellent and flawless streaming when they are playing advertisements. But when watching actual content, it’s slow, skips, and glitchy. My only source for CNBC is streaming. Sometimes it works ok for a while but inevitably the live stream cuts out every minute or so. When I restart the app it happens again and again. It is worse on the AppleTV but is practically unusable on my iPhone and iPad. If this isn’t fixed very soon I’m going to start streaming Bloomberg. I worked in the financial industry for 35 years. I watched the first day of CNBC many years ago. Over the years I’ve seen them go from unbiased to very biased. I consider myself an independent and don’t like programs or apps with strong agendas. CNBC is hard left. I don’t watch anymore. My go to place for stock info. Good general business news. Received only three stars because I tire of reading the slanted and misleading articles by John Harwood and his ideological ilk. Why do you have this terrible font size and massive white space between lines? Like, um, it’s bad. Send updates! Thank you for the feedback, but you don't hear or understand my concern. My concern is that the article layout is terrible and very difficult to read. I have the system defaults globally on my iOS 11 device, which are wonderful for EVERY other news / media app I have. The CNBC's choice of font / layout / line spacing / and default size is abysmal. I urge you to go grab any major news app and read an article, then look on yours. Youll find is very difficult, and changing my font size would make CNBC's seem marginally better, but every other app is now huge. Respectfully, it's not me it's you. :) Heres an exercise to really drive home my point, look at any story in the app, scroll down to see how the text looks (looks bad, euh?) ... Now open that same story on CNBC.com mobile site, it's worlds better, it has thought, layout, and most importantly can be read! Make the app's layout, font, etc look like the Web app. If you guys need help with copy design, etc, drop me a line happy to help! This app is really concise and well organized. Not the best stock screener but it isn’t meant to be. It does provide a great portal to business news and market activity. Only complaint is why do I still see Watchlist News for stocks I removed from my Watchlist months ago? Definitely it’s the best one! That's the best I've seem. All information that u need, easy to find. Ijust live it ! Best financial app I have found. Colorful detailed watch lists with extended trades. CNBC news and features. I’ve been a CNBC follower for years ..... love all the reporters, interviews, news when happening ... so informed so good... thank you!!!! Knowing early in the morning, what is happening now! 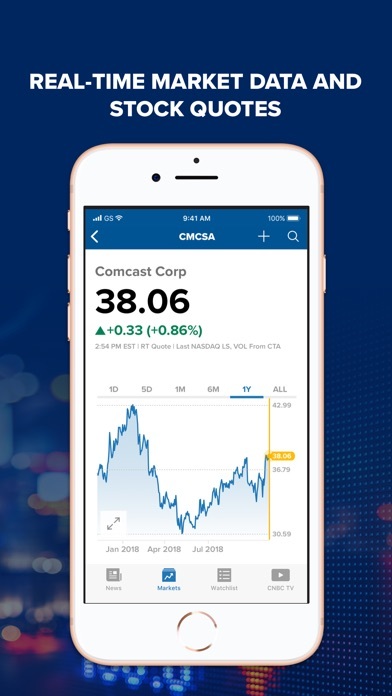 The CNBC App is filled with many useful business info, charts, videos, etc. My sole quibble is that the reportage is often slanted to the Left. I would have given 5 stars if the analysis were closer to the center. It is a must to have this app if you trade stocks. Even for serious traders it’s watchlists for following your stocks and getting the latest news affecting them is a must. Way to left, there is to much opinion. I like the look and ease of use of this app when it comes to quickly finding out how the markets are performing. The articles written by the CNBC staff are complete garbage and biased, offering little if any benefit to the user of the app. I have always enjoyed the finance reporting about the Stock Market. CNBC does a really awesome job. Generally pleased with the iphone app. I do get a little tired of reading trash and propaganda about our President but have learned to ignore the obvious NBC media bias. Incredible source for real time market news. Why do you have this terrible font size and massive white space between lines? Like, um, it’s bad. Send updates! Real time news and markets at my fingertips 24/7/365. I trust CNBC for information that guides my investment choices. NBC @ MSNBC ARE THE BEST NEWS CHANNELS ON TV. I watch them all the time, you never hear a lie from this channel unless of course it’s from the President or other Republicans, or others. The thing I love is when you show us what really was said or done . That is the best way you let us know you are always telling the truth. Thank you for that. Liberal left wing reporting detracts from business news. I enjoy the news briefs at the top of each feed. Furthermore I also feel most of the news isn’t politically biased. That’s good when you want a straight story. I can always receive the latest news and business updates quickly and easily, and lots of it . Half the time it gives me error that there is no internet connection even though there is, but then it is still gives me all the data. Only way to get rid of error is to restart the app. CNBC - your one terrible weakness! I watch CNBC every day. The only thing that disturbs me is Joe Kernan. He is a terrible interviewer!. And, he constantly distracts with ridiculous chatter that is cheap and childish. Do you not realize that people take their finances and investing very, very seriously, and want to hear from your knowledgeable guests in an intelligent way. Kernan interrupts and gets into cheap and meaningless chatter. Time and time again when he does this I just switch to Bloomberg Or CNN. He is the only person who causes me to switch channels. He was away today and how refreshing and excellent your Squawk Box program was. Please have your producers make changes with Kernan. I been following CNBC. For years. Enjoy most commentators and guests. I listen to their view. Do not agree all the time. The only one I don’t enjoy is Sara Eisen. She is too political and always makes comments with guests trying to trap them against President Trump. Getting tired of her. The very fact that this pop up would not go away made me lower the rating. It crashes sometimes. Otherwise I’d give it five stars. Easy to read and good content. Last I heard CNBC is supposed to provide financial news. That was my understanding. I came to that conclusion based on different data points the least of which is their motto "First in business, worldwide". Yet the entire app, like the network is hemorrhaging at the seams from an over saturation of anti-Trump propaganda. I get it, you're socialist and you hate Trump. Now that I've stipulated that I understand that fact, CAN I PLEASE GET THE FINANCIAL NEWS NOW?!?!? No? Cool story. Deleted. At this point your just a socialist version of the useless Fox Business network. Liberals are the most frustratingly annoying group of whiny cry babies to ever walk the planet. I've often voted based on how I felt things are going and who I felt would provide the best leadership. If it was a republican great. If it was a democrat, fine, whatever. But because of how the left leaning media sites have ABSOLUTELY LOST THEIR MINDS I WILL LITERALLY NEVER VOTE FOR ANOTHER DEMOCRAT JUST BECAUSE YOU ARE ALL SO ANNOYING!!! The idea that I cannot get regular, dependable financial news is beyond the pale. I at least understand the other networks doing it, that's what they have always been. But CNBC? You already have a dedicated socialist propaganda site, it's called MSNBC. It's literally the 24/7 socialist propaganda that you love soooo much. WHY CAN WE NOT GET DEDICATED FINANCIAL NEWS? HOW IS A 24/7 FLOW OF THAT CRAP ON MSNBC NOT ENOUGH?!?!?!?!?!?!?!? Copper and oil demands are hiding a slow economy! Really? it’s cowhides that show that the economy is slowing... sure right. what kind of crackpots are you quoting..
Too much anti Trump. Trump is not the problem. Wasteful spending and $20 trillion debt is the problem. I’ve been using the CNBC app for well over 10 years and while they periodically update their site (much to my chagrin - I don’t take change well) the app still delivers a great product. Nice to have a filter for news specific to equities I own and am interested in. I’ve been watching CNBC for over 16 years going back to Maria and Mark, sure do miss that man. I get my World news updates here, latest info on Technology, stocks and much much more. Love Cramer, Joe, Dave and Becky in the morning. My go to app for financial news! Very easy to navigate, all the top stories are right there on page one at the top. Real time index info! Excellent tools for building your own portfolio. Very informative... would like a live stream option to the broadcast easily available. Live App repeatedly does not work on iPad. I keep getting content not available outside US. Tried deleting and reinstalling but still get error. My ISP is US and I am in the US and I do not use a VPN. So what gives? This is a big glitch. I used to watch CNBC exclusively but have given up on it. One star is to good for it. Solid app - needs Chromecast connectivity! Love the app for its content and ease of use. I just wish I could connect it to my Google Chromecast so that I could watch videos/shows on my tv! I love CNBC. I love the content. But, this is the worst app I have ever used. And I have used thousands. I use it on my Amazon Firestick and I literally have to force stop and re-enter the app every 15 minutes because it freezes. Great job CNBC!!!! It never works. Hope to see options prices live. Needs to be fixed and updated! Please make the app functional with split-screen for iPad that use iOS 11.4. I have to use Safari for split-screen, when updating various data on a number of spreadsheets, and find I’m using CNBC much less often. I have learned to ignore the political bias and haven't bothered with the articles for over a year. Had to stop watching the videos since evidently the closed-caption button doesn’t work, and it’s way too distracting. But ok. Haven’t compared to other apps. App works better than before; would be nice to watch live CNBC without carrier. The great thing about business news is that it has to be accurate, if you make something up, people stop listening. CNBC gets right to the point, and distinguishes between news and opinion. Si far, this is a great help for traders. I consider it is important to check this app before any investment. Thanks. CNBC has great articles on the economy, fed funds, and the market in general. I've been very disappointed on the news feed on occasion because it fills up with Anti-Trump articles that are supported only by opinion of the writers. Stick to the markets not political views. Excellent sight for tracking personal stocks . Lots of related news about the market. Just tap a stock in your list and get everything you need to know about it. Keeps me informed when big financial events happen so I can make good investment decisions. Staying informed and the news is reliable. No point in waxing nostalgic about what CNBC used to be and lament what it has become. Easier to just delete the app and all the nonsense, download a financial app sans an overtly political agenda disguised as “financial news”. Too many quality alternatives available to put up with that. After many years of relying on CNBC app and TV for market updates and analysis I’ve deleted the app and the channel ad well. Dang! I miss Cramer already. Actually terrific coverage! Really enjoy the play back feature of recent interviews with business leaders. Always a great view of the business and the important decisions being made. Love it. It gives me very important financial news before i start my day. This app is great for market news and updates but there needs to be a time and content filter. I don’t need a 10pm update on what Trump is doing tonight. That’s what Twitter is for! Seriously, unless what he ate for dinner is going to cause the market to collapse, I don’t care to be interrupted by it. This is supposed to be a business app, but the articles written are so biased it’s become sickening. The font size on any articles are too small to read and should give the reader to be able to adjust that to their liking. Generally a good business site but never misses an opportunity to take a dig at Trump in every headline. The CNNC app is good and works most of the things me. However, watching videos on it is painful as it keeps buffering half the time and one misses out in important info. News articles are informative, so no issue with that. I love this easy to use app! It’s a snap to get stock prices, historical performance, ratings, and much, much more. Also love the daily business info. I use this app daily. It’s a great source of info but would like to see more powerful features built into how the watchlist areas work and made a little less clunky. Also video feature consumes a ton of phone resources and difficult to get to real-time CNBC - which in today’s day and age I’m surprised by. At work we have CNBC on all day and I have come to see it as a comprehensive (and mostly neutral / balanced) source of news. Imagine my surprise to find that the app is mostly sensational click bait with misleading titles and little content. I am pretty sure that different people do the app content than do the TV program. As a result, I find Bloomberg’s app to be much more informative and I use this app to only see what noise the echo machine is generating that day. Like app. Info timely. Love charts etc. Seems like a lot of articles are bashing Trump for no reason, except to make moderates or conservatives not want to always use CNBC. I can not watch shows that aired 8-12 hours earlier.. So I can only watch financial shows that were aired TWO days old. Why stream old news? It should be called old CNBC. I always check my facts on this site. Keep up the good word. The news flashes keep me up to the moment. It’s a good one-stop for both international as well as domestic exchange news. And best of all, no Joe Kernan nor Larry Kudlow. The app allows me to check the latest news that affects the financial markets. Whether positive or negative, it is my fastest and most direct source. It appears to report in an unbiased manner which is rare today. It’s setup with consideration to currencies, commodities & insightful stories of what corporations are doing! I use the info every day in order to stay informed! I always have difficulties watching CNBC live using my iPad and phone. Picture start and stops as does the volume. I do not have problems with Bloomberg with my mobile devices. Overall a great app! There is a persistent annoying bug: it has a tough time recognizing the return of a WiFi connection but keeping indicating “No Internet Connection” while all my other apps are already up and running using the WiFi. Please fix it! Thanks! I enjoy CNBC’s format for my mutual funds. However, I wish I could put my number of shares in this format and get a quick snapshot of my account each day. Again, I enjoy it a lot and look at it numerous times during the week. I enjoy the CNBC app for market news but I don’t particularly care for the general news stories. They are too political and it’s obvious that they slant to the left on the political spectrum which is an NBC trait. I would prefer to have unbiased reporting. We don’t need politics everywhere we turn. I am either watching the network on TV or checking the APP off and on all day long to check on financial as well as other news. Always on, timely and relevant. Great app. Look, I follow the markets daily and am an avid investor, but I am sick and tired of the biased politically opinionated articles that appear here and in other media sites every day. We all disregard them and tune them out because we are intelligent individuals who don’t like to be told how to think or what to believe by others, but these liberal types who dominate 90% of our airwaves and websites keep coming at us from all directions, including this site. They’re such nuisances. Every now and then I just get fed up with them all. They’re like a pesky fly. They’re like telephone or spam solicitors who just keep popping up in our lives and never seem to let up. It doesn’t do any good to complain though. They have control of the media. So much better than the Bloomberg app! This app is just right for my curiosity at this point in my investments. Great coverage, easy to navigate. Love it! 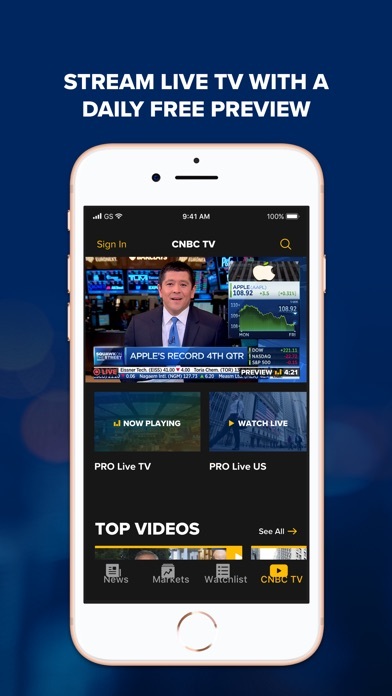 I want to be able to watch CNBC through Sling app which appears to be offered within your app however I cannot get it to connect with Sling when I try. The most annoying aspect of the CNBC iOS app Is that it does not provide for background audio, live streaming or otherwise, when navigating away from the CNBC app. I find this extremely frustrating bc I would like to listen to CNBC while doing other tasks. By not addressing user requests for this feature, it appears that CNBC doesn’t really care about it’s user experience. CNBC needs to get some better software app developers and management. The app is quirky, clumsy and buggy in my opinion bc navigation does not work properly, volume levels are inconsistent and do not provide a loud enough range, and videos frequently fail to load and do not play consecutively in full screen mode. On a positive note, I love the CNBC content and breaking news alerts. While many users criticize CNBC as having a liberal bias and for its up to the minute reports on Trump and geopolitical news, I disagree. Such news is indeed relevant and correlated to almost instantaneous market changes. Your app is fine. Most stories fine. But if I want far left political nonsense I’ll watch NBC, or CNN or MSNBC or read WAPO. Keep it business related or lose my interest. Glimpse of the market performance with related economic & political news of the day organized in a nutshell thumbnail modules..
Good platform. Too much political news and not enough business news. Watching a hockey game, this app stalls and crashes every five minutes. Pitiful. You would think NBC would spend money on servers, but I guess not. I’d like to have it become easier to connect to the account when I’m away from home. I was logged in at home but it doesn’t always allow me to reconnect to watch the shows. Otherwise, everything seems great with it. Great App use it everyday but news section is so anti-trump it loses its credibility. Stop it! Just provide the news as it relates to the market and let us decide how to use and interpret it. Great app for securities market intel. Written and video options available. First for business, first thing on my iPhone X every morning. I understand that the things that happen in politics affect the market and individual stocks, however the news alerts on this app are so anti-trump in their bias that I know I am not getting objective information! Half the time a stock that I follow report earnings and this app does not give me an alert, but if stormy Daniels has a news conference you can bet you’ll know about it! It would be an improvement to see total returns (including dividends/coupons) for mutual funds versus price returns only. CNBC is fair and truthful. I like being well informed. Love this app. News is always on point and recent. New tools and market trackers at the bottom are awesome, you can check foreign markets at any time. My favorite financial news app. *I do miss the list of up coming Financial and economic report being released at the end of morning briefs. This app works! I can listen to CNBC in my car that doesn’t have satellite radio. You always have the most up-to date news! I love the squawks in the morning specially Joe And Peggy and Andrew , them comes the legends Jim Cramer And david , then the power lunch with the Jude, the colosing bell , then the brows , with the Melissa lee and Guy Adami, then the best the the ending with the Master again Mad money with the man the best Jim Cramer again, can gets better than that , thanks everyone sorry if I missed few names. You show accurate. And timely info. Very accurate forecast, very professional staff and interviews are precise ! It's very convenient to look at stock information. One thing that needs to improve is that the news related to specific stocks is usually out-of- date. By my own interpretation and count, articles covering or mentioning the President were negative or highly critical about 80% of the time, and favorables only occurred about 20%. More cunningly, to most readers not as observant as I am, the very selection of minor or unnewsworthy subjects that CNBC tagged on the president was over the top, IMO. Dozens of the press equivalent of drive by shootings appear weekly and are inserted by CNBC editors who clearly disfavor Trump and the Republicans. For proof, let’s have CNBC’s left leaning website editors post the entirety of articles covering Obama and his administration for the comparable week ending last year, 52 weeks ago. The insidious dislike of the President by CNBC is patently obvious. Is it possible to stick to financial news and leave the politics out ?? I’ve been using this app a long time and I’m going to switch to another one because of the constant negative political articles in my face. We come for market news. Decided to delete it again. Market information (stock quotes, futures, etc.) is excellent but content is bad. Analysis is often wrong. Articles are often wrong, subjective or highly speculative. Not reliable information. Please adjust your dynamic font. While I love the small font setting on my iPhone, your app makes the font insanely small vs what other apps do. Please adjust it to a realistic small not a micro small! Thanks! I love the app, but it only works when I am using a wifi connection. Never on my 3G or 4G. I like the ease of use but annoyed by the left leaning bias in their articles. Nice business news app. Great way to track stocks and keep informed both on business and political matters. Stock tracking is easy. I use this every day for stocks and news. Very slow to switch between quotes. The App provides most of the content that the regular website offers and provides immediate updates to breaking business news. If I could change anything it would be for the app to work in “Landscape” mode as well as “Portrait”. I'M A PRETTY BASIC USER . . . Primarily I'm simply a stock price checker, and am happy with this app. Occasionally, though I notice a delay in displaying prices. Up to date quotes news and not too liberal. Great means of watching and monitoring the market and individual stocks but the news stories are nauseatingly liberal, anti-Trump, anti-Republican. I don’t even bother reading the news stories because the headlines are enough to turn me off. It’s important to me that I remain informed and updated to the financial and political news every day. The CNBC App accomplishes that as it is constantly being updated. The news articles are concise and easy to read. It is easy to access and use. I can be updated any time I choose regarding my stock portfolio. Reviewing this app is a big part of my daily rountine. Please make the app functional with split-screen for the iPad Pro models. I have to use Safari for split-screen, when updating various data on a number of spreadsheets, and find I’m using CNBC much less often. I have learned to ignore the political bias and haven't bothered with the articles for over a year. I’ve noticed there are discrepancies in the information. For instance the Price/Earnings on AT&T is not correct. Or at least it doesn’t match up to the other stock apps like Fidelity or Yahoo Finance. And a few other discrepancies too. So I just use it for the current stock price and charts. I look at other sources for more important info to determine whether I want to buy stock in a company. This app allows me to keep up with developments in the financial world. Articles are to the point and timely. Fabulous. Fabulous. Fabulous. This site is very biased against our President. Disappointed with the amount of negative coverage in articles presented on website. It’s ok 👍 I like the lay out because it invites you to look around. As your looking around you’ll discover other information that you were getting from another provider. I would like it if you could post committees. Of course it would be monitored to restrict inappropriate comments. We have been losing the trade wars for years!!! Way to anti trump. Coverage of tariffs does not include specifics on companies and jobs lost because of Chinese and others unfair trade practices. Coverage should be balanced. Lots of suffering out there, underemployed and unemployable people because of unfair trade deals to us. COVER THAT!!!! Except for Rick Santelli, most of the CNBC analysts let their NY anti-Trump biases dominate their views. Today they opined that there is an “investor class” that is being penalized economically by the President’s efforts to reduce the current negative balance of trade and protect the IP that will be the basis of our future economy. Whining by millionaires turns my stomach. Santelli has his Middle America head on straight. When it comes to market news and updates, use the app multiply times a day. Love it, along with Cramer and other CNBC TV talking heads. When it comes to reporting other news, your coverage is a left leaning rag. If I do open up one of your articles, it has nothing to do with reading what you call "news", but rather for comic relief of what your nut job reports are spouting, and stories they themselves are creating. Stick to the markets, your good at that. Leave the news events of the day to Fox. Any NBC affiliate can’t be trusted. If you want the most up to date information on the markets or the world, CNBC is you best all around one stop website! Nice App for the most part. Has a tendency to be buggy from time to time. It seems it works great and then I get a new update for it and then it buggy for a while, then I get an update that fixes the issues, and then it is good again. It seems to be a rinse and repeat app. Not always 100% reliable. Love and Use this App everyday! Keep all stocks in Watchlist and use all the time. My favorite stock and business news app. Thank you! Love the ability to manually sort my watch list. So many stock apps do not have this simple feature. Wish there was an option pay to remove ads. They are not obnoxious sized ads, but would still be nice to remove that clutter with a pay option. Great app wish there was a chart on bitcoin! Great programming, love changes ! Have used it for years. I would tweak it,but this is what we have. Thank you! This is better than Yahoo Finance app! I watch CNBC to stay abreast of business and investing news. Lately I have reduced my use of the station and the website because of its increasing anti-Trump political focus. Continuing emphasis of Trump, Mueller, polling opinions and John Harwood’s negative spin on everything Trump does has sent me to Bloomberg. I wish CNBC would get back to business and leave the Democratic Party support and spin to the rest of the NBC crowd. I love the app’s notification feature, which keeps me apprised of news that’s important to me & stocks that I’m watching. I also love that I can use my cell data—rather than internet connection—to read the articles. Easy to use especially pre and post market information. Would be 5* if the watch lists could be populated in both the iPad and iPhone apps. Yes, the app asks if want to link my watch lists with other devices, when I say yes It freezes. Love the App, however, the watch list has to be entered twice if you have it on your iPhone and iPad. Why don't they integrate the two? Have commented to CNBC but no response. Would be 5 stars with the integration. Since the 4/16/18 update the app takes 10-20 seconds to display its first screen. Selecting a stock symbol to display its latest values is also slow, often showing only the top half of the screen, then after 10 seconds or more, the rest is displayed. This is on a new iPad Pro, not only at home, but at several other locations, so it’s not the WiFi or provider. I have done a full shutdown, etc., and this doesn’t help. Please make the app functional with split-screen for the iPad Pro models. I have to use Safari for split-screen, when updating various data on a number of spreadsheets, and find I’m using CNBC much less often. I have learned to ignore the political bias and haven't bothered with the articles for over a year. Very well organized site with current news and information on stocks and the flow of markets. My number one choice for a quick check on the health of economic movement. One thing i find annoying when listening to cnbc is the faux conflict that certain moderators seem to like to generate. Not cool. Arguments are not lucid discussions. It is also disturbing when certain moderators act like they know more than the guest and or don’t let the guest finish their thoughts. I am interested in the thoughts of the guests and not certain moderators. Biased, sometimes fake news particularly of political nature. You have wonderful daytime shows but they are not available on ON DEMAND. FAST MONEY, MAD MONEY, SQUAWK ON THE STREET and FAST MONEY HALFTIME REPORT should be available on demand as well. Those shows are superior to your evening format IMO, especially for stock watchers after work. Great livestream coverage although I will say my Bloomberg live video app buffers less and cuts out less if I walk around the house. Little klugie when watching video clips from earlier - that needs some work. Relevant ads, not too many. Good data stream of stocks. Charting could be better. Best app for financial news and markets that matter. If I want to know what’s happening around the world in real time this is the place I go first because they filter out all the noise Give vital information That is useful for making investment decisions. The only app you’ll need to follow your portfolio and the markets. First Class. I’ve been using this app for over a year and am happy with it over all - with a few caveats. Number one is that I agree with other reviewers that CNBC writers stray a little too frequently from reporting insightful, fact based business news, and veer off into left leaning, anti-Republican slant. I don't mind it too too much since I can read polluted news and separate key information from the blather. But still... Actually, I find the broadcast channel to be more balanced and helpful than the articles in this app. The other thing I would like to see is a tweak to the portfolio tracker. Right now it only tracks prices of stocks in your portfolio. It would be MUCH more useful if it also allowed user to input #shares owned, and purchase price. Then it would be a true portfolio tracker. I mainly use this app for watching CNBC Live on my phone, and even running LTE with a full signal, the video keeps hanging. Really annoying to watch and I wish there was an option to turn off the video and get only the audio part of the Live streaming. I enjoy the financial reporting. However, I believe this organization should keep the politics out of the mission of reporting financial news. Far too many articles are slanted against Republicans and the office of the president. It makes everything else seem suspect. I find this app very helpful.My one observation is that information regarding individual stocks is often not timely. Timely, informative, easy to use. 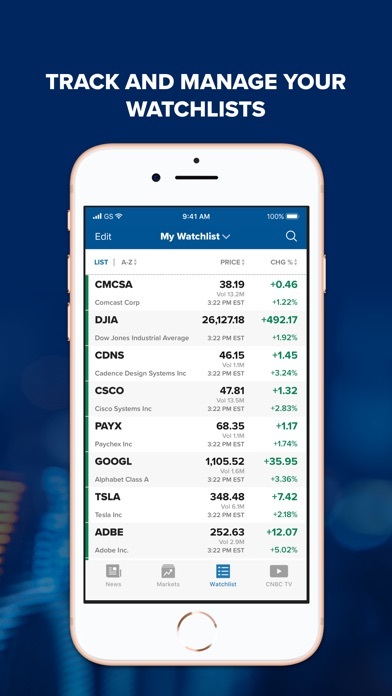 This app lets me check my watchlist very quickly. I don't need to wait for facial or fingerprint authorization from my broker. I also find the "futures" data very convenient. Since I use this on my iPhone and iPad, the automatic updating for both is great. Easy to use and set up. Especially enjoy the daily news and the after market movement section. Luv the no reports from trump. Wish there was more space to track, say 15-20 different stock shares and improve the load time. Uninstalled after getting stupid pop up video ads. Great app for stock market news!! Needs a fast menu with major subjects on the side or top at all times. It's a chore to keep clicking backwards to find subjects ( like news, markets and the like.) I always click the x when ads pop up without paying any attention to the content. So it may be best to put ads discretely in view on pages people choose. Pop ups are annoying! On the other hand, market conditions are very current.Some more work and this will be a great app. Try to get more balanced stories when covering politics. Maybe a republican or two. Too much left wing clap trap. SUPER TOOL TO KEEP TRACK OF US ECONOMY AND MARKET. First off, when this app delivers market data, it’s great. More and more, however, it’s simply a political opinion vehicle for the writers to bash whomever they don’t like. Note to the CNBC folks: drop the politics and stick to market-related info. It’s terrific. Clear stock prices and insightful news stories. Easy to use! But I’d love to see more and stronger business news. Maybe time to partner up with Bloomberg or get more budget from parent NBC? Focus more on big picture and investing. Stop with the Trump hatred . This is my go to app to follow the markets and to follow all down to the minute world news. Very informative, very user friendly app. Great, great, great. You get after hours and pre market notifications. This is the site I checked first thing in the morning. It provides me a quick look into all market trend for the day. It also gives more in-depth information when I need to do research. Like the contents. But doesn’t read loud the article like it does read loud in other websites on iPhone. Double tap the top doesn’t take you to the top as the function used in iPhone. The app is timely with pushes that don’t disappear so fast like other vendors’ do. There’s time to grab and read the content. How many guests pay to present their views or sell a book I wonder. Tell us the truth? CNBC plays on home tv 24/7. I have the app going when I’m out. CNBC on their game with timely news which is relevant! This app is amazing! I love it. Unlike the Trump channel, otherwise known as Fox, CNBC and it’s sister channel MSNBC give us truly real news delivered by thoughtful, intelligent well-informed people, not the ditsy blondes of both genders served up by the Murdoch clan. Thank you. You’re my major source for financial and political news every day. CNBC TV streaming is one star. It would stall, then crash the app. I tried sign out and back in. I tried delete and reinstall. Nothing works. Why can’t you use the same engine you have in NBC Sports app for streaming? It makes watching CNBC TV with the app unwatchable!!! No time waster.. The designers got the user ask right and to the point. I want financial news. I like the app. Though I’d like to be able to listen to pre-market news in the early morning. That might be a tweak. HOWEVER, like with sports and Hollywood, the left (NBC) is deliberately injecting strong leftist political bias, i.e. propaganda, into every story!!! Marsha, Marsha, Marsha! (Russia) What crap! Where is the focus on Hillary? Obama? The left, like China, wants single party rule. How about, just report the financial news? I love the app all except the live tv I live at the beach so no reception problems ever I mean not one but this app freezes on live mode like crazy it’s not even worth trying to watch! After months of being great. Now my watchlist keeps being deleted and I have to input the symbols all over again. Don’t know what is goin on. This only applies to the iPad, but live video/streaming full shows is broken. It does not let me log in. Good application, but my biggest complaint is the choppiness of the live feed, even on 100Mbps WiFi. This is a very good app, it send updates and breaking news. I love the alerts! It’s so up to date with live news in regards to financial markets, companies, etc. I also love how the tickers for my watchlist change as they do, other apps lag and take time for the price to update. Extremely difficult when it comes to wanting to execute a trade but with the help of this app, it makes it a lot easier. Great job to the developers and if there is an update in the near future I can only imagine how better it can be, now let’s trade. Every time this app and the people delivering us news is accompanied by the most vile pictures along with their headlines: smug, arrogant, awkward, and rude! They always have a disgusting photo of The president and the fake hair. Some Wall Street Einstein looking fool has his hand on another clown’s shoulder, and more foolish photos. Jeff Bezo photos are horrible too. Looking like Dr. evil. Poorly chosen, awkward photos and bad contributors for CNBC makes this app horrible. At least stocks are easy to read. Please fix the app to show ios clock, signals etc at the top. Stop with the bias and non-factual political headlines. Seems broken. I thought this was a finance app but all I get are biased news clips bashing the President. This app never did this from 2009-2016. What changed? stop giving the gloom-and-doom outright haters a platform on this app in this amazing robust economy. It is getting harder and harder filtering out this group of spin masters as I just want the hear and learn from the facts by proven individuals. Thanks. Occurring in both iPad Air 2 (latest iOS 11.2.6) and iPhone 8. Is anyone else seeing this behavior? Previous build was more stable. Live TV quits in minutes or even seconds, unwatchable! This app has everything!!! You can track your stocks, as well as stay informed on all financial news as well as breaking news. 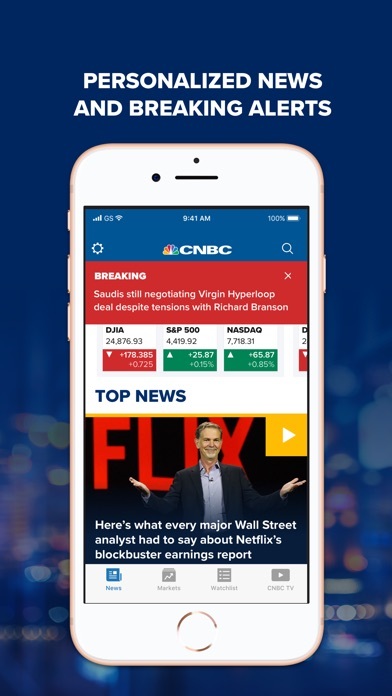 Stay informed with CNBC app! Only works for a couple minutes and then it crashes. Organized incredibly well. Not sure what u get for $30/Mo. If I knew more I would subscribe. Stats are great. Too political with liberal slant. This app would get 5 stars if it weren’t for its laughable liberal, left wing media anti Trump/Republican bias. But what more could one expect from an NBC property haha. Get a good laugh here at these immature political articles if you desire. I suggest you do what I do: just skip anything here pertaining to politics and stay with their business and financial content! What a joke! Political negativism to the hilt haha. I don’t know about you, but I’m sick and tired of reading about other individual people’s negative, anti presidential political opinions in just about every media outlet today, including what should be a source for FINANCIAL news, CNBC. UTTERLY DISGRACEFUL! Excellent job of keeping track of my stocks and mutual funds. The info on stocks in watch lists is not complete at all. If it was people would pay for the app. One thing that is almost always incorrect is the text above the commodities prices on the Home tab. It does not realize that after hours the market prices of commodities has changed trend cause its being bought and sold in the rest of the world. 9/10 Times the text says gold rises etc when it shows that it has fallen. Just get rid of the text comment if no one is willing to update it! Live video is useless. Always crashes. I tried on X and 5s. Both fail to keep a steady video. It would be nice if it offered just a streaming audio feed so I could listen to the market news while at the gym. I don’t need to see the useless heads I already know what they look like. This might be a nice work around to your failed video player. On iPhone 7+ with newest software. The app never loads news stories. The top news, technology, energy, all the news feeds are completely BLANk and never show any stories. Video always crashes. Very frustrating app. If you added a few more ads and pop-ups, you could probably obliterate all useful content completely. Maybe next update! I get every notification twice. Really annoying. Great way to follow my investments and the market. Very straightforward and clear. When you focus on business topics, you are valuable. When you focus on politics, you are boring. Easy to use, lots of diverse and reliable information. I've downloaded and deleted a lot of financial news apps, but this one's a keeper. One day with time to waste I was in a navigating mood and BEHOLD just happened to come across CNBC and at that moment I fell in love with its content, its reality and most important found that my precious time was NOT wasted!! Since that particular time ‘a favorite’ site was found, very detailed and forward not wasting my time that I am a dedicated follower, thanks!! Can't make live video work on older iPads. Gives all sorts of irrelevant nonsensical messages when trying to pull live video. Also you can't simultaneously view the live video on versions of iPad where it works, while surfing other apps. CNBC easy to understand and always gives a clear explanation for fluctuations in the market. Solid content, even with the NBC liberal bias. App works well and provides broad market coverage. The app is great but would like to see more metrics. Great updated stock quotes, something the apple app can’t do. Futures showing always wrong Not accurate. CNBC will say on tv show that market will open down and instead opens up etc. CNBC has always been the place to receive expert info on the market and the players and participants. Much better and a five star rating than the last review that I posted. Audio only option so we can listen to it in our cars without eating up the data plan with video we can't watch. This is a no brainer. Useful app. The articles are sometimes excellent. I downloaded this app and signed up for the 30 day trial. During that time or use the app daily and without fail no matter where I was and how I was connected The streaming would jam and I would miss whatever it was I was trying to watch. You would think that CNBC would offer an audio version without video of live TV... It seems that streaming audio there would be less chance of freezing or jamming. This is the best app I’ve found for keeping track of my portfolio during the day and extended hours. Only thing missing is the live ticker! But has everything else you'd need in a financial news app. The most important part to me is the breaking news pop up feature, which shows you breaking news in a red bar at the top of the app if something big happens, like the Dow rallying. Highly recommended. CNBC used to be a reliable place to get news. Now instead of actual news, it’s peppered with editorials and opinion articles that have a very leftist slant. Just complete garbage to me. I long for the days of more objective media! I use CNBC app every day to keep up with the markets. Too many ads after you enter the site. Great information. Love this site can see articles on the left that helps you decide what you want to continue reading on that particular issue. Easy to see how the stock market is doing. Watch and read everyday sometimes more then once. Excellent app for a quick review of my portfolio. Great detail on each investment. This app would get 5 stars if it weren’t for its laughable liberal, left wing media anti Trump/Republican bias. But what more could one expect from an NBC property haha. Get a good laugh here at these immature political articles if you desire. I suggest you do what I do: just skip anything here pertaining to politics and stay with their business and financial content! All I need latest market news and current quote on my watchlist. Thanks and keep it up. The complaint is in the title. Settings are correct in my IPhone. Rebooted the phone. Deleted the app and reinstalled and still no notifications. Must be a bug in the app? The app is useful and provides the information needed. My only complaint with this app is Too little business news with out a political slant. Everything is democratic or anti-Trump. Why no ability to stream to chromecast?? CNBC does an amazing job categorizing all the important data points for Stocks. The app makes it easy to navigate so pertinent information is at your fingertips very easily. Really enjoy access to up to date financial news and real time quotes and charts when I'm away from my desk. I use it more than other apps when I'm on the go. Articles load faster than ever. Video experience is so much better! This is the app for monitoring your portfolio! Easy to use and pleasant on the eye. It is loaded with features should you want more. Cannot say anything negative, keep up the good work CNBC! Great but needs more preferences! App is great for what it does but it isn't quite 5 stars. Really, desperately need to be able to limit the notifications to things I'm interested in. On or off is simply too vague. Need a widget for checking my custom list of things I'm watching. Love the app, because I do not have to listen to CNBC panelists “ talking over each other” to the point where you cannot understand what any of them are saying....eg; fast money! Articles are very left leaning and CNBC has a Liberal bias. I really like the app, but the content is terrible if you are moderate to right leaning. Every time I open the app it pops up the main screen and then the stock quote menu pops up immediately even though I haven’t pushed any buttons. If I get breaking news on my lock screen and I click on it to view it the Apple open and take me to the story and once again the stock quote screen will appear above the story so you can’t see it even though I haven’t done anything. This needs to be fixed. Aside from that it’s a great informative app and keep me in tune with the stock market 24-7. Once again, update wiped out my watchlist. Sync button does nothing. App support goes to “page undergoing maintenance”. Tired of having to remake watch list! I really love the CNBC app, but not the new one! New app version would be cool if it ever opened ...takes several tries and minutes to get it to populate and stop spinning. Never had this issue with prior versions. This version as of December 2028, is a bad format. You read the same headline 2 to 4 times in just the first page. Why all this repetition? Before every different interest was in a different Tab, now everything id mixed. And you don’t know where everything is. Went to MarketWatch. Could you update this app to iphone X compatible interface. Two thick black on top and bottom really not that impressive. The new app is very informative and quick, welcome to the 21st century. They just updated the App for the iPad and screwed it up. In the Watchlist you create, you cannot cancel a stock display once you click on a particular stock. Before you could click on the stock again or click an X at the top of the display to eliminate display info. Also every time you open the app you have to start over again—it requires several clicks to get to your established stock list. Before it always opened to the list you had set up. Bad update. Yep it is prettier but not more functional. CNBC App is almost as valuable as the daily market programming. In other words it’s great and provides a good tool for tracking investments and making decisions. I love this app and used it multiple times every day. I am able to store all my securities on a watchlist and check on them as I wish. The App update now takes forever to load. The new app has too many images and not enough content. It loads slowly and often only loads partially. The same story is splashed across multiple sections. CNBC is targeted, presumably, for people who want current/relevant market and business info presented in a concise manner. The current iteration of the app does not meet this need. I don’t like there is not option to change the fonts (too big and bold). Lots of issues with watchlist. Common figure it out!!! Great business reviews if you can cut through the anti Republican crap. Among other things the new version lacks the ability to quickly check the latest news on particular companies you might have in your portfolio. Many stories listed on the company page don’t even mention the company. The older version was not nearly as muddled and was my “go to” app for financial news - this version feels cumbersome and I will be looking for an app with a more straightforward approach. Anyone who rates this new version as great apparently never used the old version. I've written to CNBC directly a few times in their "contact us" section. The whole thing is hopelessly cluttered and combersome. The old version more compact and useful. Please go back!!! Too many complaints to list here. I’m just extremely disappointed in this update. The previous version worked great, loaded fast and the user interface made sense (I’m a graphic/web designer). I am now looking for another financial app. This app does not work properly with voice over This new update needs accessibility added. I have used the CNBC app for years successfully but everything that got me the info I needed seems to have vanished. The Dow, Nasdaq and S and P futures, I’m not finding the implied open. CNBC what were you thinking. App will probably end up being deleted. Not sure it’s even worthy of the one star I gave it! Latest update appears to have poor review in terms of design and I have to agree - lost cohesiveness blocking fast information delivery. The home section is not well designed and unnecessary. The Top News section has way too many pictures and not enough information, especially viewed on phone. The previous version was much better and practical. Ur kidding on the changes? I was a daily user of their app until this update. On the iPad u could see your watch list when trading and watch their tv at the same time but not anymore. Now this app has turned into snapshots of videos that take up 90 percent of the screen vs showing relevant news in a small space. It’s sad really. U. And tell that their dev team does not actually use this app. Not to mention the iPhone app is gone that use to show your stocks in real time. Basically, what was a great app is now a difficult to use video snapshot of the news. I don’t know about everyone else but the new format is bad. I do not like it. Nothing was wrong with the old version. You made it too complicated. I don’t need to see the same article 7 times on the same page. That makes no since. Charts are worse and info is worse. I like to see dividend % and now that’s gone and so am I because I will find a better app to use. The new app is not at all good with the font style. Old one is pretty good. Reading the indices sideways is very weird. Why made the change? Please optimize this app for iPhone X.
I used to love this app and used it multiple times every day. I am able to store all my securities on a watchlist and check on them hourly. The new update froze the app in time and is stuck with the information from the day before and it takes forever to load. Worst update ever! Need a fix to use the app ipad pro because after the download it is missing the edit button for deleting a stock from a watchlist. It is there on my Iphone 8, but the Ipad pro it is not on the upper left corner as usual. Now x to close certain pages is missing on the Ipad, tho you can tap the top left corner and it seems to work most times. The same goes for videos if you stop before the end, no x appears to close them. Positive on the new font, it makes reading easier and clearer to the eyes. Lastly news for individual stock normally contain news that has little or nothing to do with the stock, just used to fill the news area. I’m still uncertain how the pre market is calculated. Could you provide some detail? I haven’t experienced fully the new update. Big improvement I like is the video/TV section. Faster to stream videos at much better quality. To improve: There were many areas to improve both the earlier and this new versions. - font: bold and round. The new trend of font makes fewer words viewed in a screen. Bold font is also very annoying, esp in news headlines and company description - stock price and graph. Who would need a big font for 2 prices? The earlier version allowed me to view prices after trading hours and at close and graph in one screen (small phone screen) without a need to scroll down. Who cares so much about this big price font size and spaces? This font problem is same with the watchlist listing stock symbols in bold text. Another issue that CNBC app team doesn’t address but I guess it’s due to the stock content coverage analyst: some stocks’ news updates disappear or reappear times after time. Sometimes the update has only positive news of months ago. For stocks that have negative outlook, it seems the news update is empty at that point of time. Positive: the font of Ratios part looks neat. Graph seems to better reflect latest price (I was so annoyed at how graph only showed earlier data esp after trading hours). It is now much slower, harder to quickly find the information you want, and fails to provide stock data as the market opens. I suppose they were trying to drive revenue, but in its current state I’m not going to even open it. Bring back the old version. The redesigned app is horrific. Clunky, stuttering, difficult to navigate. Hope this is a dressed up beta version b/c it is awful. Try again. Version 5.0.1 discards all the user data from previous versions! It may be a useful update, but there is no excuse to not carry the user data from previous version over to the new updated version! I’ll be seeking some other ad-supported stock tracker! Hopefully one that values the user and their data! DON’T INVEST IN THIS VERSION! These apps always disappointed me but not this one. If I had one issue it would be ETF symbols like YINN and others get put in as company issuing it not as symbol so it’s hard to find. Still this one is million times better than any other one they’ve had before. Good job CNBC! The new update ruined the app. It was easier to navigate the markets page and the news page has turned into repetition central. Do not care for new website. Somewhere between the the two recent upgrades 4.5.5 and 4.5.6 the app performance tanked. Have been using the app for over a year with nothing but good things to say but recently, not so much. Please bring back old app. New is based on mobile website and doesn’t look or feel good. UX is bad bad. Old app was good. I understand it is more to maintain app and web but it is worth it. So close to deleting the app. Pictures took a lot of space on the new CNBC mobile app looks inconvenient. Please Keep them small or optional for readers. I personally prefer to see more topics than few topics and large pictures. The latest update shows the same few stories over and over as you scroll through the feed. Also dominates the media of the phone, I can’t have audio playing in the background and read the news. I don’t like the update. The small chart on right side of watchlist page should be the same style chart showing on detail page. For example I want a high low close chart not the line chart that defaults. Overall is great but it cut off my music when I first launch the App every morning, why is this happening? What has anything to do with the sound of my iPhone? Very readable I hate the videos that shut off with movement of the curser and do not include the bar to allow you to select the part you want to hear I stopped listening to them. Keep it up. It’s a good distraction from the political news we are bombarded with! The distortions and outright lies of Fox News are hurting the social fabric of our country and world. What can you as an organization do about it? It will become the downfall of our country and economy unless something is done. What will you do? This station used to be a good financial reporting station. Recently, the liberal bias of some of the reporters is getting out of hand. The CNBC app used to be wonderful but this new version is a big downgrade. What they did is take a perfectly good app and screwed it up. This app is garbage now after the recent update. Looks like a little kid designed it. Charts are horrible! Since the format changes a week ago, not nearly as enjoyable. And can we have a few hundred less articles about Cramer? Still missing a few things! The app works great—very dependable. I’m not always as pleased with the left-leaning content. The TV channel is more balanced. CNBC finally lets control the news feed. I use the site to follow and track the stock market and my portfolio. Don’t want to see all the click bait headlines(politics). Now I can filter what I see and eliminate most of the stuff that I don’t want to see. Clearly logged in. But watchlists don’t sync. Very frustrating. Has always been a bit buggy, but this upgrade has stuck the knife in its heart. Would urge NOT to upgrade until they figure this out. Newest update to the interface: TERRIBLE! The new changes to the interface now make you scroll and scroll to see all the stories. Why did you have to devote so much space to images????? One wants to scan the headlines quickly to find stories to read - now it is a long, drawn out process of having to look at images that take up so much of the viewable page. Less is more - this is a total failure for people who want to read business news and data..... How about offering the option to NOT view images? Hate it now!!!!! This app is so close to being great, but really lacks in providing individual stock news. I realize this is a CNBC app, but please look for all relevant news from all sources and publish. Stocks should not make big moves and “no news” showing up. Don't be greedy! Let me have all the news! I am still using your app. Excellent up-to-the-minute stock action and after hour markets. Wide-ranging reports on commodities, pre-markets, currencies, and bond reports. However, news reporting is biased and completely substandard. It’s good but I can’t see my watchlist and live tv on the same window as before. Whoever designed this latest UI needs to be fired. What happened with ver. 5? Version 5 has turned a stock app into a news app. While some news is about stocks/companies, it now looks like a gossip app. With previous versions your watch list stayed. With version 5, they’ve all disappeared. Too many large pics and article headings are too big. As an developer, we’d call this new version a “visual mess”. The Total Returns do NOT give an ‘as of’ date which makes the data worthless. It's a major issue that third-party music apps like Spotify are turned off when opening the app. I will never watch a video on the app so this is an issue when I'm just trying to view the articles. This new version again reinforces the app’s trend of increasingly becoming a TV entertainment app rather than a tool for traders. While it is now easier to watch CNBC live, there is now less info on individual stocks. The news photos are way too big and completely wasted the valuable spaces on an iPad which could be used for showing charts and data. Hopefully, some day, the real market trading guys can take back control over the design of this app from the TV broadcasters. Seems buggy after every software update. needs better debugging before a new release. Loved how easy previous was. Hate the update. Really like the fact you went back to “drop down” selections. It’s got lots is shortcomings. What was wrong with the old one? So much easier. Yet you still haven’t fixed the glaring issue that being lack of pertinent news 805-236-1511. Steve. Market data was large on the bottom of the screen previously now is very very small running on the top. Why would they make it so difficult to see? Not everyone has 20/20 vision. CNBC used to have a great app until they downloaded an upgrade. The app freezes in a few spots preventing link executions. No longer useful. (IPhone) edition). After months of fanfare, the new format rolled out . . . and it’s horrible. Why have market information at the top only to block it with breaking news all the time? Why make organizing stories so hard? It’s almost like they had IT people come up with the new format without UI experts. I hardly use the app anymore. New version to repetitive to scroll through. Videos start playing when topics clicked on disturbing everyone around. Will limit my use of the app. To time consuming to find good articles to read. Make CNBC App great again!! Excellent change. More focused with the banner at the top. Thank you for putting the time and effort into making at least my experience better. When breaking news hits, the notice cuts off the share price quotes. Last few days running VERY SLOW......??? I like the watch list presentation and the timely quotes. The news section has a lot of content and advertising is not overwhelming. My pet peeve is that the same news story can be displayed 5 or more times - what’s the point? Latest version (12/18) less user friendly - stories sorted by focus rather than chronologically necessitating more hunting. Also loads much more slowly. Much preferred previous version. Great, familiar CNBC experience now on mobile. Easily access the news and data you need from your pocket. They just made a great app horrible. Improvements are huge. Insight, information and data at my finger tip with reliable on-stream performance. The app was sooooooo much better before it was “upgraded.” I’m so disappointed. It used to be my go-to. Now it’s just another has-been. Nov 22, 2018. New format is ok, but black on white screen is very harsh to look at on the iPad. Maybe a light green instead? Hoping that will change, I’m updating to 5 stars. And note it now supports split-screen! Awesome! This enables me to update spreadsheets with ease from my watch lists. A dream come true. Only wish I could swipe back through prior results I’ve looked up like the previous version. This newly updated app takes forever to load, frequently crashes, and makes scrolling through recent news harder due to lots of large pictures. CNBC continues to be ET for the capital markets. For the thinking investor, nothing beats Bloomberg. Who would you rather get your start of day insight and perspective; the talking heads on Squawk Box, or Tom and Francine diving deep into global Economics, Politics, Finance and investments on Bloomberg Surveillance? The old version is more research-friendly than this updated version that is filled with all kinds of news but the stocks’ performance. I opened this app a few minutes ago and it force-installed without me prompting it to do so. I choose the non-updated CNBC app version that explains everything about a stock: inception date and all. It has been over a month now and still no update for the iPhoneX. Very lazy. Going to look for alternative. The latest incarnation of the CNBC app at the end of 2018 seems to work well for the most part. It works way better than the website in terms of streaming video for some reason. Better but still pauses way too often. One feature I would like is ability to have audio only mode. I'm usually listening with Bluetooth headphones when working out and don't need the video feed. May help to drain battery less with audio only. Try to stay away from negative political news stories unless it is relevant. That’s what CNN is for - which is why I don’t read CNN. CNBC ratings declining so they revert to thrashing about with inane clickbait headlines such as “Market pro who saw bear market sees catastrophe ahead”. This is reporting? The old versions were much better. Every time a new version comes out, it gets worse. Please bring back the version from 3 or 4 years ago. The current version just repeats the same content with different headings. I am a CNBC Pro subscriber. I pay yearly and will not be renewing. The new version of the app will not stream video to my iPad. The audio works fine but I then have to listen to ads. I would recommend that anyone wanting to watch CNBC subscribe to YouTube TV for slightly more than CNBC charges for their Pro subscription. I emailed CNBCs support with a detailed description of what I tried doing to solve the issue and received a canned response asking me to try what I had already done. New update makes this app very unfriendly. Was my favorite now I rarely use. Sorry. I only wish that I could watch CNBC live without needing to pay. It is great being able to listen live however! I could do with less clearly left slanted “news”. News itself is a good thing and much of it does has an effect on the market. Politically biased news is less than worthless, often missing the mark and purely rhetorical. Opinions are a good thing, everyone has one...but are not meaningful news. Need a fix to use the app ipad pro because after the download it is missing the edit button for deleting a stock from a watchlist. It is there on my Iphone 8, but the Ipad pro it is not on the upper left corner as usual. Now x to close certain pages is missing on the Ipad, tho you can tap the top left corner and it seems to work most times. The same goes for videos if you stop before the end, no x appears to close them. Positive on the new font, it makes reading easier and clearer to the eyes. Lastly news for individual stock normally contain news that has little or nothing to do with the stock, just used to fill the news area. In addition on watch list there is no edit for individual stocks to be deleted off the list...bad design. Only have a link to add to the watch list, no delete but you can hit add cancel and get to the delete list, very very odd. Come on fix the x off buttons on ALL pages, add the delete buttons and get it right! Low rating for yet another total refresh. I have many choices for info, and was just coming back to this app after a long time way after the last total refresh. This one is certainly not an upgrade. Home page market info changes per time of day - is annoying. Tonight, day after Dow down 650, no futures listed!! Definitely need to bring back previous up/down closes on charts. Nice to see if a stock has closed down 5 days in a row. Harassing people for reviews is not acceptable. I deleted the app immediately after the harassment for a review. If I want to leave a review I will. Leave me alone ! What happened to my watch,ist. It’s totally gone. In it’s place is something resembling the Yahoo.com home page — all kinds of videos clips about sports, politics and other general interest items which are useless for the one purpose the app did better than anyone. Please bring back the prior version, or allow users to configure so as to be able to use the old format. Why do you no longer have the ability to pop-out and minimize a video stream? The best part of the app was the ability to view a live stream while navigating to other apps. The usefulness of the app just dropped by 90%. Will not be using it much from here forward. After a wobbly start this improved app is pulling it all together in a sensible way. Keep on going! Prior to the upgrade I was a heavy user of the CNBC app on iPad. Changes in the charting function have made is much less useful to me. I now use Yahoo Finance and E-trade apps for charting my stocks. I need both to replace the prior function CNBC had. Your news content is still the best but I now can’t tell when the videos were made. Makes the videos less useful. My favorite news feed.giving me everything I need about trump.keep reporting on him and let’s impeach him.he gets flustered when media pursues him.keep up the good work. Talking heads coverage of market with a left tilting pitch. Incredibly left leaning and the headlines are overly negative due to Trump derangement syndrome. Still the best collection of news, updates and market based info. The apps fine what is bad about CNBC is having subjective right wingers cheerleading the Republican Party on squawk box and employing racist like Rick Santelli. I watch to market and enjoy stories that effect the markets with this ap. This app now kills Spotify. I can't listen to music and look at this app at the same time, uninstalling unfortunately. New design terrible. Add a “Classic” option to use previous view which was better in all aspects. I’m now looking for another app. Great format , love your site.! Finally Stream Audio Only Option!!!! Great for listening on the go without eating up data for the video. New UI is excellent in browsing and showing news I want to read. It would be nice to see short videos about latest news as watch list and continue plying mode. 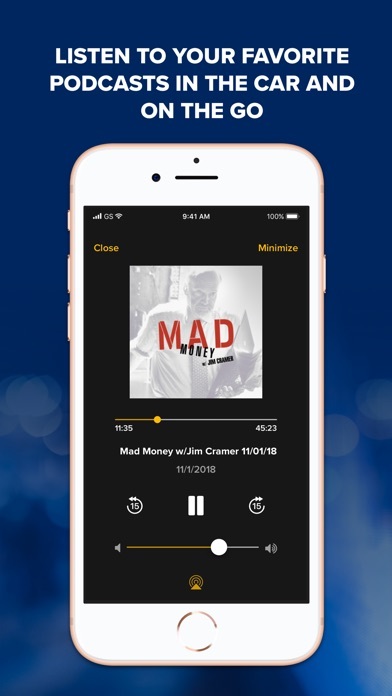 With radio and video infused perfectly coupled with all the podcasts and high level financial and related news, it’s the one stop Finance App. Your coverage of the markets is spot on but your left wing politics are boring. I typically change the channel every time you bring on a liberal spout off their dogma. Stick to business stop the left wing propaganda. Other wise I’ll just keep changing the channel. I made a watch list and there is no news for my stocks, meanwhile I get news on other apps on my stocks in my watch list. The lay out is a mess. A nice quick view of what’s going on . Great to be able to check how things are going during the day. Go market ! Pro TV will not start. I pay for pro tv and use it everyday. It takes me at least 20 minutes to get the function to finally pull a stream. Old app worked perfect. Very well done. I love this station for the up-to-date business information provided. This time the app pauses any music you have playing when in the app. We put up with the sponsored content and the slow loading ads but don’t give us an update that negatively impacts other phone functions. New users, don’t download it until the release an update! The new update is horrible. Doesn’t have recent news quickly available! Hard to find things - where is the personal finance section? When these web designers create a new interface, do they ask people what they think?? This new design is horrible. It used to be clear and concise, now it’s just a giant mess of scattered data. Update stinks. Put the market summary charts back where they were. Also you reduced the size of the charts. Much harder to read. Please return to original size. Looking for replacement app. Time to fire the product designers. CNBC is great for current stock market news and data! Please revert to prior version !